Whatever Happened To... The Millennials Who Started A School For Boko Haram Escapees? Aweofeso Adebola (in white shirt) and Ifeoluwa Ayomide (in cap) pose with some of the kids in their education program in Abuja, Nigeria. In July 2017, I wrote a story about two young Nigerians who quit their office jobs to start an informal school for kids in a camp for displaced people in Abuja, the country's capital. How's the project going? A couple of years ago, Ifeoluwa Ayomide, 23, and Aweofeso Adebola, 24, started an informal school in a camp for displaced people in Abuja, Nigeria. 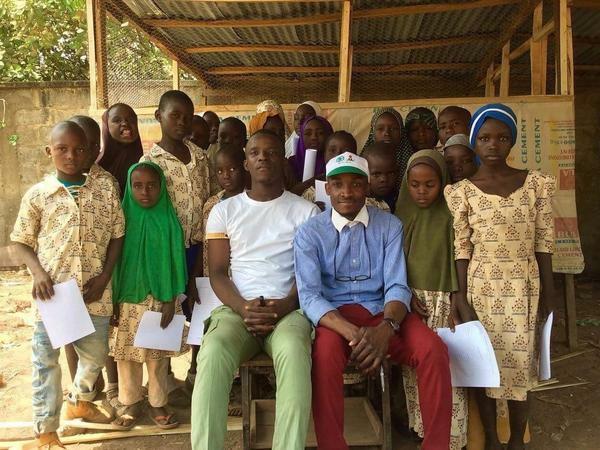 They combined forces with a dozen volunteers to teach a variety of subjects to the hundreds of kids in the Durumi camp: English, math, history, civics, health, science and agriculture. The young men had previously worked in Nigeria's parliament. Ayomide was with the department of new media in the office of the Senate president, and Adebola was an aide in the budget and planning department. They had no formal training as educators. They had no curriculum and had to depend on whatever textbooks they could get with donations from family, friends and other individuals. Their goal was to give these kids a real chance for success after their families had fled to protect themselves from the militant group Boko Haram. But the pair had concerns that their impromptu school wasn't doing that job. "It was just a makeshift school without the proper learning facilities and environment," explains Adebola. "And since we didn't register the school, there was no way we could give certificates to the children to help them progress to the next level of schooling." So last year, the founders implemented a new strategy: instead of teaching the kids themselves, they arrange to enroll them in nearby schools — where there are trained teachers who use a planned curriculum. "This year, we decided to move them to learn under teachers who are way more qualified, to help them interact with other children and learn better than they did in the camp," Ayomide says. In January, the group officially registered as a nonprofit called the Young Shapers Club. Most of its work is now focused on providing scholarships for students — which cover tuition, school uniforms and learning materials — and organizing after-school programs that offer mentoring and counseling. The nonprofit is now paying expenses for 117 children — about $30 per child in public elementary schools and about $47 for the handful in private schools. Adebola says there no challenges in getting the kids into the schools. The money comes from corporate organizations, private individuals — and a side gig selling chickens and eggs. The project has grown, too. It now has a board and 30 volunteers — up from 12 — handling administrative, welfare, fundraising, communications, legal and project management activities. In June, the Israeli Embassy in Abuja, after hearing about the group, approached them and donated 70 computer tablets. A month later, an Abuja-based learning center gave five children a chance to attend their summer school to learn coding, robotics, web design, animation, app development and financial literacy. During the semester, the nonprofit works with at least 100 children back at the camp after school. During these sessions, Adebola and a small group of volunteers talk to the kids about their performance in their new schools. "Young Shapers Club is proving that when young people come together they can make a positive impact on society," says Medinat Abdulazeez, an Abuja-based researcher on violent extremism and displacement in the Lake Chad region who has been following their work. She is not affiliated with the group, but after learning about Young Shapers Club, she decided to sponsor a child. "They gave vulnerable kids a chance to realize their dreams." Linus Unah is a freelance journalist covering global health, conflict, agriculture and technology in Nigeria. Find him @linusunah.